DALLAS, TX (March 14, 2017) – Highland Park Village will begin extensive renovations and expansions to a portion of the historic property in April 2017 as part of the latest initiative to elevate the customer experience and preserve the shopping center’s iconic and authentic Spanish inspired architecture. Following recent approval from the Town of Highland Park, preparations are in progress to remodel and improve Building G, currently occupied by CHANEL, Starbucks, Anthropologie and William Noble Rare Jewels. Located along Preston Road, construction is slated to start in April with plans to completely remodel and re-tenant the second and third floors of Building G, make modifications to the first level lobby, add an iconic tower on the east side, an exit stair tower on the west side, and create 6,100 square feet of traditional rooftop terraces. The third floor will be expanded to a total of 19,000 sq. feet. The plan for the second floor, which is approximately 21,000 square feet, will be to convert it from offices to several retail uses, including the relocation of William Noble Rare Jewels. 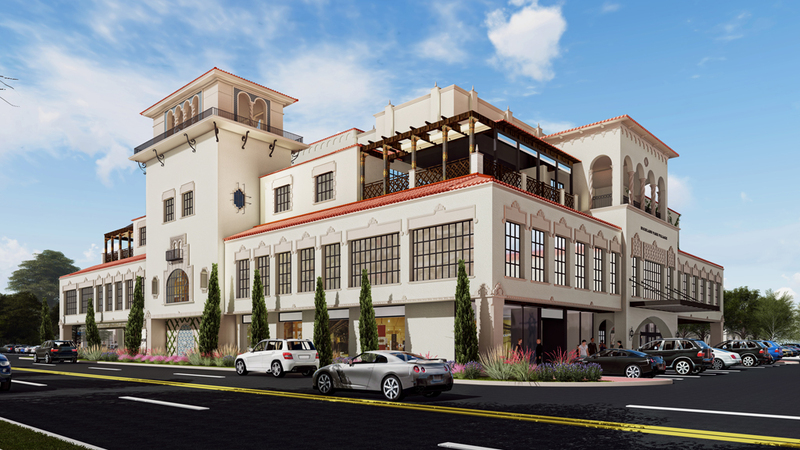 In addition, the exterior will be drastically modified to reflect the rest of Highland Park Village’s traditional Spanish architectural style and aesthetic touches will be incorporated into the building that was originally constructed in 1965, including Spanish tile, wooden balconies and façade details. A ticketless valet system and newly relocated valet station will also be a part of the updates to better serve guests and improve traffic flow. Highland Park Village has brought on OMNIPLAN to design the impressive project and The Whiting Turner Contracting Company is leading general contracting efforts. OMNIPLAN has helped to facilitate other recent projects on property, including Hermes’ expansion to include a second floor that was completed in November of 2015 and the remodeling of Building A along the center’s south side — now occupied by Royal Blue Grocery, St. Michaels Woman’s Exchange, Draper James, Bird Bakery, Alice and Olivia, Bandier, Etro, Dior Beauty, Theory, and Celine. The multimillion dollar project is scheduled to be completed by mid 2018mid-2018, with news of any additional tenants to be announced in coming months. About Highland Park Village: Highland Park Village is a favorite among locals and international guests alike. Built in 1931 and widely regarded as the country’s first true shopping center, the Village is internationally recognized for its architectural significance and mix of the world’s best-known upscale retailers including Akris, Alexander McQueen, Balenciaga, Carolina Herrera, CHANEL, Christian Louboutin, Dior, Ermenegildo Zegna, Escada, Harry Winston, Hermès, Jimmy Choo, Ralph Lauren, Stella McCartney, Tom Ford and more. Highland Park Village offers a range of complimentary services for our guests including complimentary personal shopping and valet parking. For more information about Highland Park Village visit our website – www.hpvillage.com.